When I worked in a pharmacy decades ago a lady came in to get her special shade of Revlon lipstick that was being discontinued. Somehow she got word of it and bought every last tube in town! Not exactly technology, but something important to her. Oh Dana, I so understand where you’re coming from. I long for the WORD programs of the twentieth century. I am even having fits getting used to an electric tooth brush (after all these years). Though I have to admit that computer word processing is so-o-o- very forgiving compared to the old typewriters, so occasionally there is a bright side. Thanks for the memories. Thanks for the comment, Annette. I am even worse than that. I long for my first Word Processing Software program, AmiPro. Yes, I’m dating myself, but I loved it. That program was as simple as a typewriter, and it never had stupid things like paragraph borders or auto numbering. Agh! Great post! The only thing that really comes to mind that may not be exactly what you’re talking about is handwritten letters. It isn’t often that I open my mailbox and find a letter, not only handwritten but hand addressed. I miss that. Ooh, right, AJ. I miss those, too. I do try to write cards when I can. I buy big boxes of blank notes so I can at least send a short, handwritten note. Too funny, I’ve never even seen this type of tie! 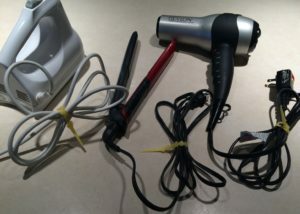 Real Simple magazine has a regular feature with new uses for products and your special yellow ties would be a good one. Hmmm, Kristin. I’ll look into it. 🙂 Thanks. 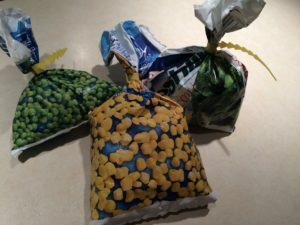 I save the twists off bread bags to close frozen veggie bags! Oooh, another good idea, Cheryl. Recycling at its best. I miss the early version of WordPerfect. That program was so easy to use and if something didn’t work I could see the coding that was messing things up. I know Corel still makes WordPerfect, but editors want everything turned in using Word. Sigh. I’m a bread baker, so I get the yellow tie thing. Repurposing AND embracing what’s new is the only way to go! Good post! Sounds as if you have the right idea, Marianne! I’m with Maris. I would go back to WordPerfect in a NY minute if I could. It was user and especially writer-friendly. It was the first word-processing program I ever used, and I loved it. 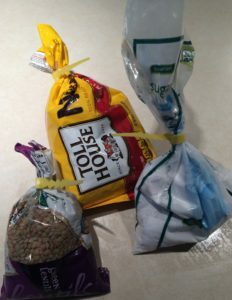 You have some great uses for those little yellow ties! 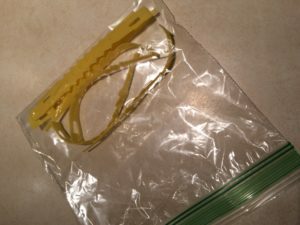 I like to keep the twisties from bread bags, but often now they use those little plastic tabs. They are pretty useless when you’re done with the bread. I also wish we could bring back cassette players, as I still have plenty of cassette tapes I would listen to. Lucy, I still have all of my cassettes. I even have 45 rpm records AND a record player to play them on. But I did get rid of the 8-tracks. They wear out. 🙂 Guess I’m just a throwback kind of girl like you. I use twisty ties. I love them. I do like a sparkly new IPhone too, but sometimes I just need to go “beta” with my life. I started with Word Perfect and didn’t like the change to MS Word at first. But that seems a life time ago. Thank goodness for grand kids, I love most new technology. I don’t have a pricey smart TV, but I do get Netflicks on my large screen only 37″ with that neat little Roku computer hook up. When my husband recently wanted my 17″ Dell laptop cuz his died I bought a 31.5″ monitor and dual Bluetooth mouse and keyboard combo and hook my traveling under two pound Acer Ultrabook up to it. I miss people being kind to each other as the norm, not the exception. I don’t cling to a particular item, but I do a practice. Even though we use a computer program for our finances, when I record in our checkbook, I still like to do basic subtraction to keep a running balance. I just like to keep my (limited) math skills sharp lol. Great post, Dana!